Big Ears Festival. Photo: Andy Vinson. MUSIC FESTIVALS ARE ALL ABOUT SCALE. On one hand, festivals solve financial problems of presenting live music by scaling up—what if, says the ambitious promoter in Tennessee, instead of eighty shows selling a thousand tickets each, we put on one show that sells 80,000 tickets…? And thus Bonnaroo is born, with an astronomical budget to work with. (Tickets this year are $337.50, which means a sell out will gross $27 million—before merch). But on the other hand, festivals create entirely new problems for music by shifting scale like this. Not all live music—not any?—is made to be heard by 80,000 people at once. It’s not even possible, without a good deal of electronic wizardry, to amplify sound to that large an audience without experiencing time delays between the stage and different parts of the crowd. Not to mention all the complications of trying to provide for the physical needs of an audience of 80,000 people—that’s a small city’s worth of food, waste, security, and medical care. Which makes it easy to understand why Ashley Capps, who started Bonnaroo in 2002 and sold controlling interest in it to Live Nation (NYSE: LYV) for an undisclosed sum in 2015, now runs a festival that returns him to the scale of eighty shows with a thousand people each: Big Ears, in Knoxville, Tennessee (population 180,000 but with existing restaurants, sewage, police, and hospitals). Of course Big Ears also returns Capps to all the financial problems of producing smaller scale shows, with far fewer resources for its extraordinarily ambitious programming, which brings improvisers, composers, and outside players together from all over the world. But one has to assume that Capps no longer worries about the nickels and dimes of these particular gigs. They are clearly booked for the quality of the music, rather than any potential profit; performers like Diamanda Galás, Mary Halvorson, Marc Ribot, Jason Moran, Roscoe Mitchell, Ikue Mori, Evan Parker, Milford Graves, Arto Lindsay, Laurel Halo, and Bang on a Can All-Stars are sure to draw the eager attention of Wire magazine readers like me, but are far from typical crowd-pleasing festival fare. And that is how I came to be in a 10,000 square-foot Knoxville event space usually used for weddings and banquets, watching a solo performance of Olivier Messiaen on pedal steel guitar. Susan Alcorn is a lyrical player, using extended technique on her instrument to pull extra poetry from it. She also has the easy, gracious stage presence of a folk or country player, telling stories between tunes, putting the audience at ease while framing her music for them. Yet even this elegant festival show wrestled with a problem of scale. The subtle musical gestures of a player like Alcorn are not fully legible in a room big enough for an audience of 1,000. And her personable stagecraft derived no benefit from the smoke machine cranking away throughout her set. It’s as if even Big Ears—which would seem to have only the best musical intentions—can’t escape some of the endemic problems with festivals. One is this mismatch of audience size with intimate styles of music. Another is the overwhelming amount of music squeezed into the confines of a festival schedule. I heard so much interesting music in such a short amount of time at Big Ears, I quickly reached a point where I felt I couldn’t absorb any of it fully. This would seem, again, to be a problem of scale—in this case, time. A player like Susan Alcorn, or Milford Graves, or Evan Parker, or indeed most of the adventurous music programmed by Big Ears, stretches time. Free improvisation, to take a particularly obvious example, doesn’t conform to a predetermined schedule. But festivals very much do. They must—they are tightly packed with events that can’t be delayed, like planes stacked up in the air about to land. Each depends on the previous one clearing out of the way. In practice, this meant I hardly ever heard the end of a set at Big Ears, because the start of another beckoned. And the end of a set is an important gesture, especially for an improviser—where they stop can be as telling as where they begin. Which left me, as I departed the festival, paradoxically wanting more even as I felt exhausted by how much I had taken in. How did those sets end that I had to leave, I wondered? And what were the ones like that I had missed entirely? I never feel this kind of greed on an evening out to see a single program of live music. But it does feel familiar from the listening I do these days to recorded music online. And like festival programming, streaming creates problems for music that don’t otherwise exist. To listen to an LP, or CD, or even a digital download of album is to listen on a different time scale than tapping into endless playlists online. Spotify’s seemingly unlimited catalogue creates a time deficit for listeners—there’s never enough time to hear it all, just like at a festival. And our listening habits bend to suit. Streaming music, I find myself clicking away before the end of albums, even before the end of tracks—something I would almost never do with a physical copy of the same recording. Just as I would almost never walk out before the end of a live show, except at a festival. The greater engagement, the less likely we stay till the end…? This describes my experience at Big Ears exactly. It’s no coincidence, I think, that the rise of festivals in the live music business has coincided with the rise of streaming for recordings. Both employ a model of increased scale to change the economics of music. But both sacrifice the intimacy, the intensity, and the finality of a given musical experience. Festivals and streaming engage more of us with music. It may even be that they engage us more with music, period! Still both threaten to leave us simultaneously overwhelmed and wanting more. The ideal state for a consumer, perhaps. But for a listener? Damon Krukowski is a musician (Damon & Naomi, Galaxie 500), the author of The New Analog: Listening and Reconnecting in the Digital World (The New Press), and recently hosted the podcast Ways of Hearing for the Showcase series from Radiotopia. 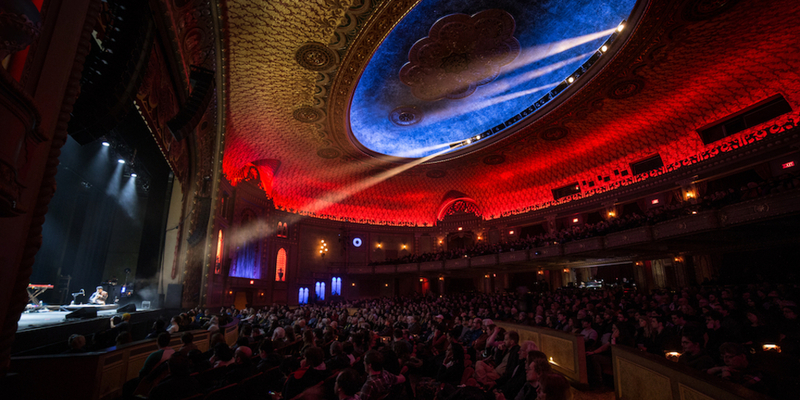 Big Ears Festival ran in Knoxville, Tennessee, from March 22 to 25, 2018.